The GEM car, from Chrysler's Global Electric Motorcars division, is more typical of what's available to today's average consumer. 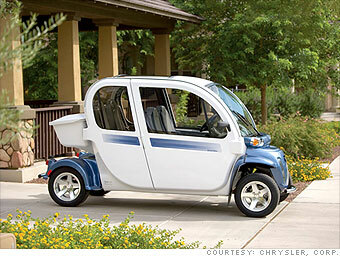 It's a small, lightweight vehicle that can go up to 25 mph. It can go just a little faster on a downhill grade, but the electric motor automatically steps in to slow it down. The 25 mph top speed is a matter of law, not engineering. "Low Speed Vehicles" (LSVs) like the GEM don't have to meet the same safety requirements as faster cars. They can only be driven on roads with speed limits below 35 mph, so highways and even faster surface arteries are off limits. But 25 mph is still adequate for many daily commutes and around-the-town errands. In many gated communities, you're not allowed to go any faster, anyway. Like most low-speed vehicles, the GEM has three-point safety belts and uses laminated safety glass for its windshield. It has a range of 30 miles on a six-to-eight hour charge, the company says. The GEM still sells mostly to fleet customers. It's available in versions with seating for two, four or six and with a flat bed or with a literal trunk, as shown here.